Many of us are squatting, many of us are familiar with squatting movement, all of us have benefits from. Our struggle is one ! That's why i call that we would show our solidarity with the squatters this sunday at big demo against evictions of Schijnheilig and many others squats. Come with the our banners, baloons,leaflets and good energy and mood. 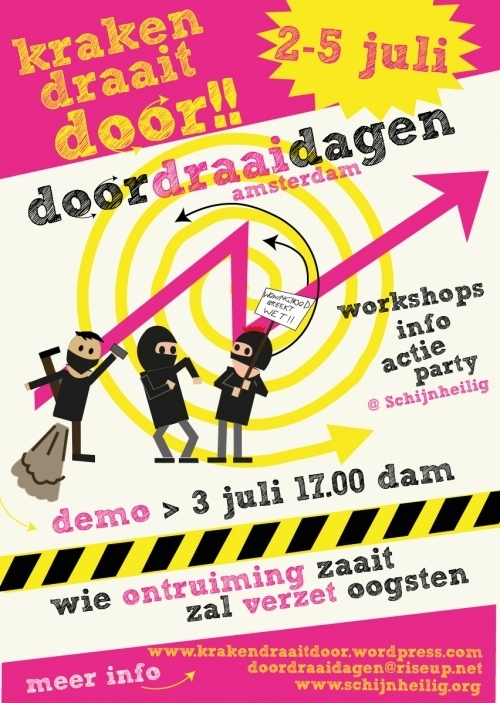 Demo this sunday at 17.00 at the dam ! Monday 15.00 Schijnheilig, Passeerdersgracht 23bg te Amsterdam. Brain storm of ideas "beyond the eviction wave" - General Assembly for Squatting Movement, so another form ( but continuation ) of City Wide meetings. Together we would like to create ideas to make some not expected steps that hopefully will improve the situation of squatting movement. Everyone may have idea about organizing for example next actions days, campaign, movie, graffiti festival, sleeping action, posters etc. Lets use the advantage that we would be many at the squatting resistance days and together brain storm those ideas, then create working groups who would like put them in to life. By doing it more in the "spanish/dutch/world revolution" way we would like to exercise new way of meetings but also we would like to show among us the solidarity with the world wide struggle against capitalism, austerity measures and social cuts. Why beyond eviction wave ? First because we respect and wouldn't like to interfere in strategy what its already prepared. Second because we would like to start to create the movements what would be more offensive than defending. With more heads we are smarter, with more hearts we are stronger, more hands are making work lighter. Together we are power ! Solidarity is our strength ! Schijnheilig, Passeerdersgracht 23bg te Amsterdam. Workshop 'filming actions' op aanvraag, mail naar: mgriks@gmail.com. Ook zullen er films gedraaid worden, meer info op de dag zelf. Dag van de ontruimingsgolf: Hou je oren en ogen open!